Rhodococcus fascians, causative agent of the leafy gall syndrome, produces a mixture of cytokinins to modify the hormone landscape of its broad range of plant hosts leading to tissue deformations and developmental alterations. Recent developments indicate that the pathogenic nature of these bacteria is superimposed on its plant growth-promoting effect. In the last two decades, its unique position as the only species within the genus able to interact with plants has been overthrown. Indeed, Pistachio Bushy Top Syndrome is an emerging disease linked to the presence of two Rhodococcus species, R. fascians and R. corynebacterioides. Both bacteria would act synergistically to cause the symptoms, giving the prospect of virulence strategies that differ from those of the leafy gall inducers. 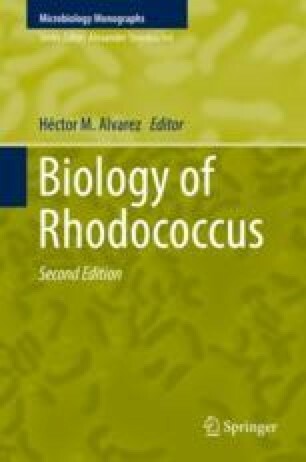 Additionally, as a result of microbiome research, it is clear that many Rhodococcus species live in close association with plants, and several of them exhibit plant growth-promoting activities. Finally, genome analyses of a collection of R. fascians isolates imply that the taxonomic position of this group of bacteria within the genus will have to be reevaluated, and likely a new genus consisting of several species will be proposed soon.